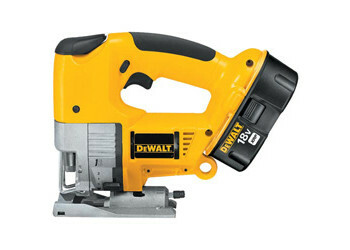 Dewalt Heavy-Duty 18V Cordless Variable Speed Jig Saw Kit. Keyless blade change system accepts universal and t-shank blades. Tool free adjustable shoe slides forward, backward and bevels 45° in both directions. Variable speed trigger 0-2000 spm for more precise and faster cutting. Dust blower keeps line of cut clear of chips.